BEACON FALLS — Indoor track and field is the forgotten high school sport. Some say it’s just a way for non-basketball players to stay in shape over the winter. Some say it’s just a bunch of kids running in the hallways. But longtime Woodland coach Jeff Lownds sees the sport in his own way. For the last seven winters, nobody in the Naugatuck Valley League has competed as well as the Woodland girls. The Hawks are seven-time defending league champions, and they should be in the mix again. Lownds pointed to the girls’ strengths in mid- and long-distance running and field events. Hailey Bernier, a junior pole vaulter, trains twice a week at a specialized clinic, and Jasmine Michie (shot put) and Stephanie Poynton (long jump) both earned top-five finishes at the league meet last year. Plus, most of the key runners from Woodland’s cross country squad that won the NVL title — namely Emma Slavin, Jaden Young, Chloe Poulos and Jill Brotherton — will run this winter. The strengths are similar on the boys side, with mid-distance and field events expected to be among the top opportunities for points. Jumper Bryan Shea and runners Conrad Filippone, Cole Barrows and George Hughes are expected to be among the Hawks’ top athletes. 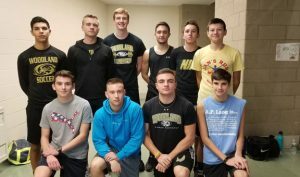 In addition, the freshman-heavy lineup that helped the boys win their first NVL cross country title in the fall, especially Chase Young and Colin Slavin, will also compete this winter. During the preseason, Woodland has practiced both indoors and outdoors. The opportunity to get outside helps some athletes — especially the field competitors — get an edge on their competition. “We’re fortunate because some schools don’t even allow (outdoor practice),” boys coach Bill Ferrare said. 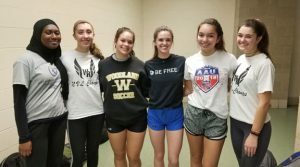 Just days before Woodland’s first meet of the season, Lownds and Ferrare had yet to select captains. They agreed that fact was a compliment to the team. The NVL championships are set for Jan. 28, followed by the Class S state championships Feb. 7. Both meets are at the Floyd Little Athletic Center in New Haven.